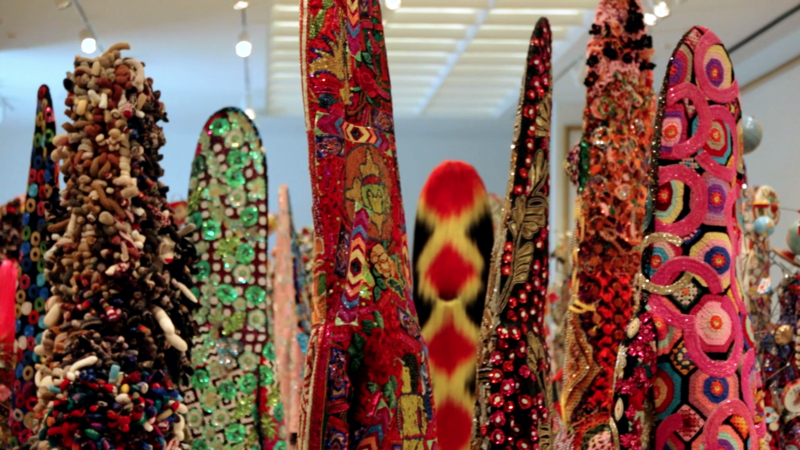 Soundsuits by Nick Cave installed during his exhibition Here Hear at the Cranbrook Art Museum in Bloomfield Hills, MI. Production still from the series ART21 Exclusive. © ART21, Inc. 2016. Cinematography: Jamin Townsley. In today’s ART21 Exclusive, Nick Cave discusses the experiences that force him to confront his identity as a black man—including being racially profiled by police—and how they fuel his impulse to create. Cave explains that in these moments he gets quiet and avoids lashing out in rage. lashing out for me is creating this. “And if I do, lashing out for me is creating this,” he says in reference to his intricately constructed Soundsuits. “The Soundsuits hide gender, race, class and they force you to look at the work without judgment.” The exhibition Here Hear, which included a large-scale community performance, was installed at Detroit’s Cranbrook Art Museum in 2015. The museum is associated with the Cranbrook Academy of Art, where Nick Cave attended graduate school in the 1980s and was the only minority student at the time. CREDITS: Producer: Ian Forster & Nick Ravich. Consulting Producer: Wesley Miller. Interview: Stanley Nelson. Editor: Morgan Riles. Camera: Jamin Townsley. Sound: Richard K. Pooler. Artwork Courtesy: Nick Cave. Special Thanks: Cranbrook Art Museum, Robert Faust, William Gill & Laura Mott.